Tinker Bell and Peter Pan Fly to Neverland and other artwork by artist Thomas Kinkade can be viewed in our artist slideshow. 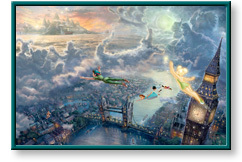 Tinker Bell and Peter Pan Fly to Neverland by artist Thomas Kinkade and other Thomas Kincade art, art work, artwork, canvases, giclees, images, limited editions, open editions, paintings, paper, pictures, posters, and prints can all be found at Christ-Centered Art. "As the third piece in my Disney Dreams Collection, Tinker Bell and Peter Pan Fly to Neverland promises to be my most exciting work yet! The Peter Pan story presents the wondrous fantasies of youth: secret island hideaways, visions of mermaids and pirates, and the irrestible urge to fly high above the world. I am powerfully aware of the tug of youthful dreams — one might even say that as an artist I strive to stay constantly connected with the wide-eyed wonder of childhood. "As with the first two paintings in my twelve piece Disney Dreams Collection (affectionately referred to as the Disney dozen by diehard collectors! ), I try to tell the whole story in a single image — what I refer to as a narrative panorama. We see Neverland in the distance, just below the second star to the right, an enchanting land rising above the clouds. As the full moon bathes the scene with its silvery light, the clouds take shape, if only in our imagination, as characters from the adventure — Captain Hook, Smee, the Lost Boys and the ubiquitous ticking crocodile. Below us we see London, its lights twinkling with a radiant glow, as the eternal waters of the Thames flow off to distant horizons. "For me, the central character of the story will always remain Tinker Bell, the enchanted fairy princess who makes the entire journey of imagination possible. As the bells of Big Ben begin to toll in the evening air, won't you grab a handful of Tinker Bell's pixie dust, and join me on the adventure of a lifetime? As Peter Pan put it, 'Come on everybody, here we go'." Image Size 12" x 18"
Add $200 to frame this paper print. This unframed limited edition paper print can be custom framed in your choice of authentic Thomas Kinkade frame. Add $295 to frame this paper print. Add $150 to frame this canvas. What is an Examination Proof? Tinker Bell and Peter Pan Fly to Neverland by artist Thomas Kinkade as well as other open and limited edition inspirational paper art prints and canvases, giclees, images, lithographs, paintings, pictures, posters, and reproductions by renowned Lightpost Publishing, Media Arts, and The Thomas Kinkade Company artist Thomas Kincade can be viewed and purchased at special sale prices at Christ-Centered Art.